Safety Mechanisms: There are numerous safety features including a pressure control valve, back-up safety valve, inner lid valve, inner lid filter, and pressure indicator. Readable LCD Control Panel: The panel includes a clock and several timer settings plus options for menu and settings. Smart technology: The microchip in the pot records all cooking experiences, allowing you to reproduce previous cooking results. If you dream of perfectly cooked rice, this may be the perfect appliance for you. 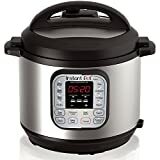 The Zojirushi Pressure Rice Cooker and Warmer automatically selects one of 3 pressure settings, then uses advanced technology to adjust the cooking time of the rice. The result is perfectly cooked rice. ​The Zojirushi NP-NVC10 combines induction heating and pressure cooking in a variety of settings. The cooker has an attractive stainless steel exterior, with a platinum infused inner cooking. The easy to read LCD control panel has a clock and several timer features. A microchip build into the pot allows it to ‘remember’ the settings of each use and to reproduce the same result each time. ​The appliance includes many safety features: a pressure control valve, a back-up safety valve, an inner lid valve, an inner lid filter and a pressure indicator which locks the lid when the pot is under pressure. ​So exactly how does this appliance work? A user selects a menu and setting from the LCD panel. Menus include white, mixed, sushi/sweet rice, porridge, brown, GABA brown and quick cooking. Settings include *steam reduce, *scorch setting,* umami and gaba brown. The Zojirushi NP- NVC10 selects from one of three pressure settings. The platinum infused nonstick inner cooking pot heats up which alkalizes the water and breaks down the surface of the rice, which studies have shown makes better tasting rice. The pressure of the sealed pot cooks the rice at a higher, more consistent temperature that conventional cooking methods. Pressure-cooked rice is believed to be softer and easier to digest. At the end of the cooking cycle, an interchangeable melody or beep will indicate the rice is cooked. Then the cooking pot will keep the rice warm until it is served. The Zojirushi NP-NVC10 is also easy to clean. The platinum inner pot is non-stick. The pot has a detachable inner lid for easy cleaning. And the exterior pot is clear coated to make it easy to keep clean and shiny. For those who value rice, this cooker provides a variety of functions and settings. It is a state of the art rice cooker and probably the best available on the American market.